Paul Connett, Executive Director of the Fluoride Action Network recently made a presentation to Dever Water opposing community Water Fluoridation (CWF). Many of his claims were just wrong – he seriously distorted the science and used this to misinform the board members. I am posting a series of articles debunking his claims. But Daniel Ryan from Making Sense of Fluoride has also entered the fray with his article Dr Connett distorts the Dunedin IQ fluoride study. I urge readers to check out the article. Broadbent, J. M., Thomson, W. M., Ramrakha, S., Moffitt, T. E., Zeng, J., Foster Page, L. A., & Poulton, R. (2014). Community Water Fluoridation and Intelligence: Prospective Study in New Zealand. American Journal of Public Health, 105(1), 72–76. That study is a thorn in Connett’s side because it completely refutes his claims that CWF causes a drop in IQ. It is an excellent paper (as well as being a New Zealand one) – which is another thorn in Connett’s side as he relies on poor quality studies made in areas of endemic fluorosis for his claims. Daniel goes through Connett’s assertions about the New Zealand study and debunks each of them in turn. The Broadbent et al. (2014) study investigated a situation where low fluoride concentrations were used. It is the only in-depth study of IQ at these low concentrations. However, I did make a brief investigation of the situation in the USA comparing the average IQ for each state with the percentage fluoridation coverage of the population in each state. I reported that in IQ not influenced by water fluoridation. The figure below shows the data – and there is no statistically significant correlation of IQ with CWF (the dotted lines show the 95% confidence boundaries).. Here is Daniel Ryan’s second response to Rita Barnett-Rose’s defence of here unpublished paper “Compulsory water fluoridation: Justifiable public health benefit or human experimental research without informed consent“. That defence was posted yesterday at Fluoride debate: Response to Daniel Ryan’s critique – Rita Bartlett-Rose. Daniel’s second response is available to download as a pdf. This is my second response to Associate Professor Rita Barnett-Rose to her paper “Compulsory water fluoridation: justifiable public health benefit or human experimental research without informed consent”. It is a response to her document “RE: CWF Working Paper Article” (hereafter referred to as “Rita’s reply.”). I wish to thank Rita for acknowledging in that papers should be referenced accurately by using citations to the original sources rather than simply referencing activist sources. I am also pleased she is getting experts to review the science in her paper and am interested to know who the independent reviewers are. In this this response I have collected a number of comments to consider under separate headings. Objectively looking at the science. Rita implies I only use ‘pro-fluoridation’ or ‘English speaking countries’ papers. This is incorrect – I cite papers which provide the best weight in regards to evidence. Science doesn’t take sides (good papers are neither “anti-fluoridation” nor “pro-fluoridation”, they present data and reasoning) and these are international. To clarify, my issue is not that Barnett-Rose (2014) was not using ‘pro-fluoridation’ papers, it was the quality of the studies themselves. Reviewers of the science should attempt to understand and evaluate the quality of the research. I also look at the quality of journal. And I try to cite papers which are in high quality journals more as those journals attract the best scientific papers. Journals use a metric called “impact factor” that basically states how many times an average paper is cited by other papers. It is an independent, objective method to judge the quality of published research. The hierarchy of scientific evidence in the literature is also important I illustrate this in the image below. Secondary reviews published in peer-reviewed, high-impact journals and high quality randomised controlled trials with definitive results should be the preferred sources. For consideration of human health effects I consider that animal studies would be placed above “expert opinion” in this hierarchy. Overall one needs to approach the literature intelligently and critically – considering the evidence provided in the individual papers and also considering other published material. Instead I saw that Barnett-Rose (2014) did not evaluate the evidence well, only selecting evidence of harm in order to persuade the audience to accept her position. There is no reason to use low validity papers when there is plenty of high quality papers but unfortunately this happens when trying to “price” a preconceived idea. An example of this is Barnett-Rose (2014) used an opinion article from the Scientific American many times as her source. This is not a scientific paper, it is not peer reviewed or in a research journal; furthermore the writer is not a scientist and definitely not an expert on the subject. This type of evidence would come below “expert opinion” on the image above. I hope such problems would be given as feedback from the independent reviewers. Rita accuses me of cherry picking but fails to back this up. I do try to use only the best sources of evidence – usually systematic reviews. A systematic review is a literature review focused on a research question that tries to identify, appraise, select and synthesize all high quality research evidence relevant to that question. The scientific consensus is that fluoridation works, it is safe and it is cost effective. We have evolved with fluoride and had it adjusted in our water for over 60 years in some countries. Developed countries where natural fluoride levels are low but choose not to use community water fluoridation (CWF) generally use other methods such as milk and salt fluoridation, which again are both safe and effective, or have very effective public health and dental systems. Over 5,500 papers have been systematically reviewed and no consistent association between fluoridation and illness has been found that has been confirmed through later research. Looking at the many other systematic reviews you will find a similar pattern. CWF is shown to be safe and effective. So the “burden of proof” really is on those claiming evidence of harm. They need to produce well supported and peer-reviewed studies which back up their claims. If there is a strong evidence for health risks of fluoridation then I totally agree with Rita that it needs to be re-evaluated. Every year many studies are written on fluoridation and continued monitoring of the scientific findings occurs in many countries with the precautionary principle of being alert to any possible negative effects. If Rita has a specific problem with the CDC or the ADA, I can use some of the many other hundreds of health organisations around the world. They all have similar conclusions about fluoridation. As I said in my first response, there is not one reputable health organisation that is against fluoridation. We already have Dr Paul Connett suggesting a massive conspiracy, I hope you do not agree with his accusations as this is generally the last resort for people who cannot find reasonable faults in the evidence but still refuse to believe it. I will not repeat what I said in my earlier reply. The review itself said that it was not relevant to exposures to concentrations used for fluoridated water and to say it is “highly relevant” is spreading misinformation. The NRC report furthered shows the safety of fluoridation. As for the “more research needed”, that is always the case with science. That is why responsible public health agencies continue to monitor research findings. I don’t see how you conclude that I “feel so strongly that imposing this practice on everyone”. I, myself, could say I am strongly against misinformation. The MSoF society is here to help explain what the actual scientific evidence shows to the public, not to advocate for CWF at any cost. It is up to the communities if they want to use CWF and we, the MSoF Society, support their democratic right to decide. Rejected the prohibition of water fluoridation based on the argument of mass medication and restricting personal rights. Affirmed that water fluoridation should be accepted based on the quantified risks and benefits, the potential alternatives, and, where there are harms, the role of consent. They also used a ‘stewardship mode’ to analyse the acceptable degree of state intervention to improve population health, concluding that water fluoridation can be justified based on its contribution to the goals of stewardship: the reduction of health inequalities, the reduction of ill health, and the concern for children, who represent a vulnerable group. the Council was thoughtful and responsible in making their decision to begin fluoridation, and had no obligation to consider “controversial factual issues” (anti-fluoride propaganda). You could say there is an aggressive campaign on both sides, but people are pushing for fluoridation simply because it works – reducing up to 40% of caries over a whole population. “…tooth decay (dental caries) remains the single most common chronic disease among New Zealanders of all ages, with consequences including pain, infection, impaired chewing ability, tooth loss, compromised appearance, and absence from work or school. Tooth decay is an irreversible disease; if untreated it is cumulative through the lifespan, such that individuals who are adversely affected early in life tend to have pervasive decay by adulthood, and are likely to suffer extensive tooth loss later in life. Prevention of tooth decay is essential from very early childhood through to old age”. The Royal Society Review also suggested that removing fluoridation would have direct and indirect costs to society. I am all for protecting the vulnerable. If individuals do not consent, they can simply choose not to partake of the community water supply (bottled water, filters, rain water, etc.). I feel this is starting to head slightly off-topic but to answer your question, if the vaccine given out is safe and effective for the general public then I have no problems with compulsory shots for children. While choice is nice thing to have, you cannot always get it, especially if it is going to lower the quality of life in children. Petersen & Lennon (2004), a WHO funded study showed dental caries remain a major public health concern, affecting 60–90% of schoolchildren and the vast majority of adults. While fluoride is not a silver bullet, it is just part of the problem, it should not be ignored when it can clearly help very effectively. Their study goes into a number of suggestions for alleviating tooth decay, one being fluoridation. As for the similar DMFT decline between fluoridated and unfluoridated countries Rita claims this needs to be considered critically. Fluoride occurs naturally everywhere and it is very hard to compare one country to others because of the many other contributing factors such as; history, culture, ethnic differences, as well as differences in health services, dental practice and assessments. The graphical evidence FAN promotes on their website and elsewhere they do not account for naturally occurring fluoride or other programs (fluoride vanish, mouth rinse programs, etc.) and different history and social practices. Their graphs also use only 2 data points for each country. There is no consideration of also changing fluoridation amounts over time and their graph is very confusing. It does not enable proper consideration of different DMFT declines in different countries. The stats show Denmark having the lowest DMFT and FAN marked them as not fluoridated, but they actually have high levels of naturally occurring fluoride. 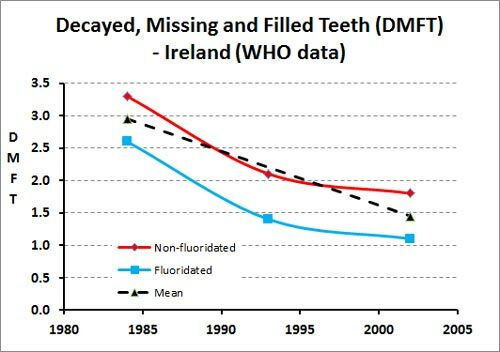 If you look at the WHO data in more detail (graph left does this for the Irish Republic using the same WHO data) you will find that fluoridated areas show faster declines in DMFT than unfluoridated areas. Like yourself, I am not a scientist – I am a software developer; my responses get checked by scientists but I would always look into the evidence in scientific studies. I avoid political or activist organisations (legitimate or not). The Making Sense of Fluoride society is not a pro-fluoridation group, we are a pro-science group. We will go with what the scientific consensus says and will spread warnings, if for example: some time in the future, CWF was really found to be harmful. a) To foster awareness and dispel misinformation regarding fluoride with a focus on CWF. b) Use the scientific method as the foundational platform upon which this awareness is promoted. a) To bring about the permanent end to public water fluoridation (“fluoridation”) in New Zealand. b) To provide resources, both personal and material, to others opposing fluoridation in New Zealand. c) To provide a central contact point for those opposing fluoridation in New Zealand. I apologise for my mistaking you and any offense it may have caused you. It was clearly a simple mistake that anyone could have made and I had no intention to twist your words. MSoF is always happy to have private discussions if you are willing to listen to our feedback. A lot of our work is outside of what the public sees but we always up for public exchanges to share to our followers. You will find that your paper got sent all over Facebook and the media; because it was publicised in a press release from FAN. That is how I found out about it. It is a pity you were subjected to insults because of that publicity. That said I was also hit with insults on Fluoride Free NZ Facebook pages because of my response to you. These insults are common and something I have gotten used too; in either case it is a shame that people feel it best to engage in debate in disrespectful ways. Fluoridation is an emotional topic for some – personally I do my best to stick with the science and keep my emotions out. Thank you Rita for making time in reading our feedback and responding to us. Rita Barnett-Rose, author of “Compulsory water fluoridation: Justifiable public health benefit or human experimental research without informed consent” has replied to Daniel Ryan’s critique of her paper. Daniel’s critique was posted yesterday at Fluoride debate: A response to Rita Barnett-Rose – Daniel Ryan. Rita’s reply is available to download as a pdf. I have now had a chance to consider your comments to my draft article. In some respects, I am flattered that you have devoted so much time to an unpublished working paper, and I thank you for giving me some of your opinions. I absolutely want to make sure that I have cited to sources accurately and have not mischaracterized any particular study I reviewed. To that end, I have now engaged independent review of my article from several highly-qualified scientists/researchers with the specific request that they review my article for scientific accuracy. After I have received their comments, I will revise my draft accordingly. Unfortunately (or fortunately for me), I did not find in your review any specific places where I actually mischaracterized any cited study. Instead, your primary points of contention seem to be twofold: (1) you object to my use of Fluoride Action Network’s (“FAN”) website as a cited source; and (2) you object to my failure to include contrary studies that reaffirm the (English-speaking countries’) public health agencies’/dental lobby positions on the safety and benefits of compulsory water fluoridation. First, with respect to my reliance on FAN. Of the 209 footnote references in my article, I believe only 17 of them are cites to FAN. Of those 17 cites, I am citing to the FAN website primarily as an easy way to get to the primary source material (e.g., studies or newspaper articles from around the world). For example, in footnotes 85-87, I could have listed the primary source studies, but I have found that many of these studies are hard to get on the internet for those who do not have paid subscriptions to the various science databases. I myself had to order a number of the primary sources from my University intra-library loan system and felt that it would be better to simply provide a link so that the reader could see the names of the studies and determine for himself/herself how to get to those primary sources. Nevertheless, your point is well-taken that I should not give the appearance of relying upon an advocacy group (including yours), and I will review those 17 cites to see if I should instead cite to primary sources. Second, with respect to your complaint or desire that I cite to contrary (i.e., pro-fluoridation) studies in addition to (or in lieu of) the published studies that I cite that tend to weigh against fluoridation, as I have already indicated to you on two occasions: I am not interested in a battle of the studies debate, and I urge you to conduct such a battle with a more appropriate sparring partner, such as FAN-NZ. Specifically: you complain about FAN not being a legitimate source of credible scientific information, but your organization is also a political advocacy (pro-fluoridation) group, and, from your critique, you are just as guilty of “cherry picking” your sources and your studies as you suggest I am. Moreover, and in stark contrast to you, the section of my article where the studies are discussed is specifically entitled: “Scientific Evidence Against Compulsory Water Fluoridation.” It is not meant to be an exhaustive examination of all studies on fluoridation and is specifically and accurately identified for what it is. I am well aware of many of the pro-fluoridation studies — as well as the criticisms of many of those studies (in terms of who funded them, flaws in methodology, conflicts of interest, etc.) by those opposed to fluoridation. I do not believe either side has definitively proved their case with respect to safety/benefits or lack thereof. However, what I do believe is that the burden of proving safety and effectiveness lies with the pro-fluoridation side, as it is your side that is insisting on imposing this “public health measure” on everyone else, even in the face of substantial objection and despite existing studies suggesting serious risks of harm. It also appears to me that the pro-fluoridation side is playing “whack a mole” with the studies weighing against CWF – often trying to hammer down/marginalize the opposition each time a negative study pops up, rather than trying to consider the evidence objectively. I note throughout your critique that you often refer to studies that weigh against fluoridation as “flawed” or “debatable” or as somehow lacking in proper control mechanisms – while studies that support fluoridation are “quality studies.” (p.8). You also minimize any existing evidence weighing against fluoridation by qualifying it: “there is no quality research” (p. 4) “there is no robust evidence” (p. 4), “there is no strong evidence” (p. 6). However, to me, if even one strong study exists, then the entire compulsory practice must be reevaluated. Please also note that any and all of your cites to the ADA lobby, or to the CDC (which, though its oral health division, works hand in hand with the ADA promoting fluoridation and thus has a serious conflict of interest/credibility problem) are unpersuasive to me – as they should be to anyone conducting even a minimum level of research into the history of and politics behind fluoridation (some of which is chronicled in my article, including the story of the EPA’s NTEU battle). Incidentally, as someone who did not have a pony in this race before doing the actual research (i.e., I am not a long-time anti-fluoridation advocate), it does not take long to discover how politically motivated many “public health agencies” and “professional dental associations” are — or how willing they are to obscure, minimize, or bury contrary evidence or to marginalize the anti-fluoridation messengers, regardless of the evidence or the credentials of those messengers (e.g., Waldbott, Taylor, Marcus, Mullenix, Bassin, Hirzy). With respect to the NRC Report, I agree with you that it did not specifically address compulsory water fluoridation. However, I believe that its review of fluoride toxicology is highly relevant to exposures from fluoridated water (and its exposure data itself suggests that some people drinking fluoridated water can, indeed, receive doses that can cause adverse health effects, including severe dental fluorosis and bone fractures). In addition, in a number of health risk areas, the NRC panel concluded that there was not enough data, and/or that more research needed to be conducted, before definitive statements could be made with respect to other potential adverse health effects due to excess exposure to fluoride. This is hardly a ringing endorsement of the safety of fluoride or fluoridation. Nor is the NRC Report irrelevant to the fluoridation debate. I see no point in going through your critique page by page to point out various flaws in it, as mostly you seem to be trying to persuade me with contrary evidence rather than identifying any mischaracterizations of the studies I did cite. I will, however, point out that your opening accusation on p. 2 that my “paper starts off by saying there is mounting scientific evidence against fluoridation” and that I used an opinion piece by John Colquhoun as my “evidence” to support this statement is outrageously incorrect, and it almost prompted me not to respond to you at all, as I do not appreciate my words being twisted or my cites misused to inflate your argument. This statement about “mounting scientific evidence” at the start of my paper (near fn. 2) actually references an entire section of my article – (“See discussion infra Sec. II-B”) — and not an opinion piece by Colquhoun, which is only referenced – appropriately – at footnote 65 (referring to “formerly avid fluoride proponents” who have changed their minds). I have no desire to engage with insincere zealots, so I hope that you simply made a mistake there. As I said to you privately, I am more than willing to revise my article where I have misstated any of the cited scientific evidence. However, I disagree with you that a discussion on the legal and ethical aspects of CWF would be “confusing” or “pointless” at this point and I would genuinely be interested in knowing why you feel so strongly that imposing this practice on everyone is ethically justifiable. Data published by the WHO suggests that the decline in dental caries is similar in both fluoridated and unfluoridated countries, and I have heard of no massive outbreak of a worldwide dental carie epidemic that has been attributed to a lack of fluoridated water (rather than to poverty, poor nutrition, or a lack of access to proper dental care). Thus, I am very curious as to why there appears to be such an aggressive campaign on the pro-fluoridation side to impose this practice on the world – and why anyone believes that personal liberties and rights to bodily integrity should be sacrificed for a public health practice addressing a non-contagious disease. I would also be interested in understanding where you personally believe compulsory public health practices should begin and end (e.g., do you believe governments should mandate compulsory flu shots? What about the HPV vaccine that the Governor of Texas tried to mandate for girls? Where should the personal right to bodily integrity begin and end, in your opinion? And how comfortable are you with public health officials mandating what is good for you? Do you contend that they haven’t been wrong on a public health issue before?). As for me, I remain convinced that CWF is legally and ethically unjustifiable. My article sets forth my reasons, so I won’t repeat those arguments here. These reasons would remain even if compulsory water fluoridation were proven to be entirely safe, which it most definitely has not, despite the presumed “majority” view in the English speaking countries. You will also find many of my reasons articulated by dissenting justices in fluoridation cases over the last 60+ years, when presumably even less “science” was available to support their nevertheless valid legal/ethical objections to CWF. I include some of these cases and dissenting opinions in my article. Daniel, I thank you for your (heretofore) civilized exchange with me and I do welcome your thoughts if you have any on the legal and ethical justifications of CWF. After this exchange, however, I am only interested in a private discussion with you, which is something you may not be interested in as it may not advance your organization’s agenda. However, your facebook posting has generated some contact to me by a few rude (and seemingly unbalanced) pro-fluoridation folks, and I have no interest in entertaining their rants (which certainly do nothing but convince me that the pro-fluoridation side has something to hide). In any event, I do thank you for reaching out and for your interest in my article. I hope to ensure that my final draft will address any legitimate criticisms/issues. Daniel Ryan’s response to Rita’s reply will be posted tomorrow. See Fluoride debate: Second response to Rita Barnett-Rose – Daniel Ryan. Daniel Ryan President of the Making Sense of Fluoride group responded to the scientific claims made in Rita Barnett-Rose’s unpublished paper “Compulsory water fluoridation: Justifiable public health benefit or human experimental research without informed consent“. That section of Rita’s paper was posted as the first article in this exchange yesterday at Fluoride debate: The scientific evidence against fluoridation – Rita F. Barnett. 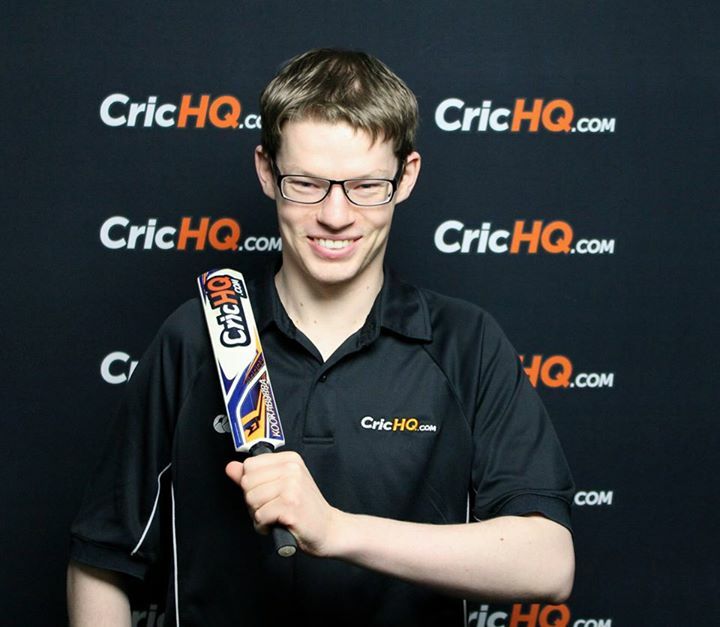 Daniel’s critique is available to download as a pdf. I have contacted Associate Professor Rita Barnett-Rose about her unpublished paper “Compulsory water fluoridation: justifiable public health benefit or human experimental research without informed consent.” It concluded that “The evidence continues to suggest that compulsory water fluoridation is no longer justifiable as a public health benefit” and “human rights burden and economic costs are not reasonable or justifiable”. There were claims about the science which (presumably) are important for the legal/ethical conclusions. We at Making Sense of Fluoride (MSoF) felt there was misinformation on the science and a public exchange would be a good way to engage in a discussion of the claims – even withdrawing those claims if found wrong. We thank Rita for listening to us and hope that we find common ground even if it’s just in the science. For the most part of this discussion I will stick to pages 13-19 with the header “Scientific Evidence against Compulsory Water Fluoridation” and breaking down into the sub-headers. First off, looking at the sources used, there are many that are comments and articles from political activists rather than primary research sources. For example Fluoride Action Network is not a credible scientific organisation. This is not a good way of reviewing the scientific literature; in fact it is very poor practice. This is a fundamental problem with this paper. “His paper rehashed earlier criticisms of water fluoridation, using selective and highly biased citations of the scientific and non-scientific literature”. “Why I Am Now Officially Opposed to Adding Fluoride to Drinking Water” from Dr. Hardy Limeback and “Dr. William Hirzy Portland letter” are also opinion pieces. It is important to note that Dr. Hardy Limeback is a member of the Advisory Board of Paul Connett’s Fluoride Alert Network. Dr. William Hirzy works for Fluoride Action Network as a paid political lobbyist. “Mounting scientific evidence”– nothing could be further from the truth. There is not one reputable health organisation that is against fluoridation. There is no argument that having too much fluoride when the teeth are forming will cause dental fluorosis but this isn’t the case for fluoridation. There is little difference in frequency and severity of fluorosis between non-fluoridated and fluoridated areas, something which Barnett-Rose (2014) seems to ignore. The CDC source given was looking at fluorosis as a whole and not at fluoridated vs non-fluoridated, but it states that “community water fluoridation programs were developed to add fluoride to drinking water to reach an optimal level for preventing tooth decay, while limiting the chance of developing dental fluorosis”. If there were any large differences in fluorosis then I would be all for another look into balancing the levels of fluoride in those areas. In fact health authorities in many countries continually monitor research findings for this very reason and that was the reason for the National Research Council (2006) review which did recommend reducing the primary MCL of 4 ppm. Any increase in fluorosis due to CWF would be in the very mild to mild fluorosis range. The dental fluorosis about which they speak in Warren’s et al. (2009) “Iowa study” is overwhelmingly of the barely detectable nature. 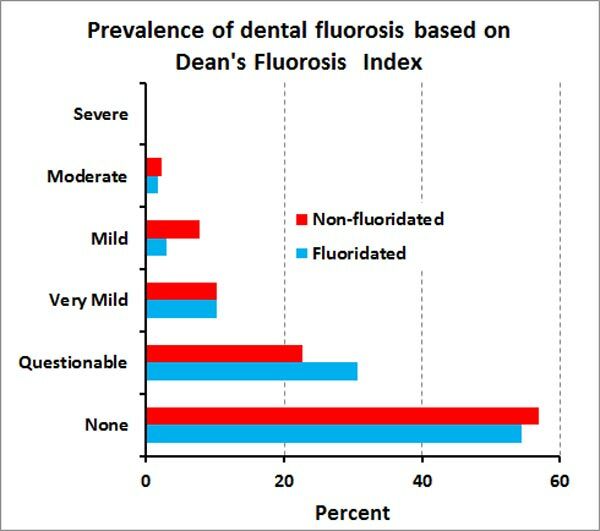 The 2009 New Zealand Oral health Survey found very little difference between fluoridated and non-fluoridated areas, in terms of the levels of mild to very mild fluorosis (which has no effect on appearance, form or function of teeth), as shown on the graph below. In fact, Lida & Kumar (2009) have demonstrated mildly fluorosed teeth to be more decay resistant. The statement that fluorosis is “the first sign of fluoride toxicity” is debatable. What sign of which particular toxicity? Just because there might be other effects which have not yet been shown is not proof that there are other effects. It presumably has been a common feature of teeth through the centuries and is harmless. “Yes, it is safe to use fluoridated water to mix infant formula. If your baby is primarily fed infant formula, using fluoridated water might increase the chance for mild enamel fluorosis, but enamel fluorosis does not affect the health of your child or the health of your child’s teeth”. “However, if your child is exclusively consuming infant formula reconstituted with fluoridated water, there may be an increased chance for mild dental fluorosis. To lessen this chance, parents can use low-fluoride bottled water some of the time to mix infant formula”. For infants and children in their tooth-developing years of 0-8, the upper limit (UL) for fluoride is lower, but only due to a risk of development of mild dental fluorosis. That’s why the UL for daily fluoride jumps to 10mg/day after age 8, once the teeth are formed. The rest of the “Dental Fluorosis” section in Barnett-Rose (2014) talks about moderate to severe dental fluorosis, which is not caused by community water fluoridation and so is pointless to discuss. Again, there is no disagreement that chronic exposure to high levels of fluoride can cause skeletal fluorosis and increase the risk of bone fractures. But you don’t see these problems at levels of 0.7-1.2 ppm in community drinking water. The Institute of Medicine has established that the daily upper limit for fluoride intake from all sources, for adults, before adverse effects will occur, short or long-term, is 10 mg. There is no quality research to show skeletal fluorosis can develop at the levels of 0.7-1.2ppm. Even the source used in Barnett-Rose (2014) says “Crippling skeletal fluorosis may be produced by levels of 10-20 mg/day over 10-20 years”. “There are no known health risks associated with CWF in New Zealand, and no severe dental fluorosis, or skeletal fluorosis, has been found. While fluoride is incorporated into teeth and bones, there is no robust evidence of toxic accumulation of fluoride in other tissues in the body”. It also noted in its conclusion “As with many vitamins and minerals, such as iron, and vitamins A and D, fluoride intakes at high levels can be toxic. However, it is impossible to experience acute fluoride toxicity from drinking water optimally fluoridated at levels between 0.7 mg/L to 1.0 mg/L (MoH, 2009), and there is no evidence of skeletal fluorosis resulting from CWF in New Zealand. It makes sound clinical sense to ingest a substance at a level that achieves maximum benefit with minimal adverse effects (Bowen, 2002)”. One needs to be careful of cherry picking scientific studies. When you look at all the data you will find bone fracture is not an issue. Vestergaard et al. (2007), in a meta-analysis that used 25 studies, came to the conclusion that “there was no effect on hip or spine fracture risk”. He also noted that “in subgroup analyses a low fluoride dose (< or =20 mg/day of fluoride equivalents) was associated with a significant reduction in fracture risk”. This showed that fluoridation can help bones when at the optimum fluoride levels. Ingestion of some fluoride is necessary as the bioapatites in our body contain both fluoride and carbonate as normal, natural components. The incorporation of ions like fluoride into bioapatites can change their solubility product by several orders of magnitude according to Driessens (1973). Posner et al. (1963) attribute the improved stability of bone to “the isomorphous substitution of fluoride in the apatite structure”. Fluoride can accumulate in the pineal gland. Calcification of the pineal gland is caused by calcium, phosphate and old age. Because the bioapatites in calcified tissues are actively undergoing mineralisation and remineralisation they easily incorporate fluoride into their structure and this leads to higher concentration of fluoride in calcified tissues than in bones generally. No evidence of harm has been found. “Our aim was to elucidate the inhibitory effect of chronic administration of fluoride upon thyroid function in cases of hyperthyroidism. It was demonstrated that such an action appears only occasionally among persons subjected to massive doses of this substance”. “Despite the relatively large amounts administered (up to 20 mg. of F~ for one injection), neither immediate nor delayed toxic manifestations were observed”. This demonstrates my point that primary sources should be used, and definitely not activist websites. “There is no scientific basis that shows fluoridated water has an adverse effect on the thyroid gland or its function”. “Shortcomings in their study mean the results should be interpreted with caution pending publication of the larger study results. Co-investigators of Bassin point out that they have not been able to replicate these findings in the broader Harvard study that included prospective cases from the same 11 hospitals”. “The general consensus among the reviews done to date is that there is no strong evidence of a link between water fluoridation and cancer”. “Fluoride in water helps to prevent and can even reverse tooth decay. More than 60 percent of the U.S. population has access to fluoridated water through public water supply systems. Many studies, in both humans and animals, have shown no association between fluoridated water and cancer risk”. “Assessing fluoride as a risk factor for osteosarcoma is complicated by the rarity of the disease and that population is all generally exposed to some level of fluoride”. “a possible link between fluoride in drinking water and osteosarcoma, but studies are equivocal. No evidence from animal studies to support the link, and thus fluoride cannot be classified as to its carcinogenicity”. It is debatable that Mullenix et al. (1995) interpretation on the study was flawed, it doesn’t matter if it was in a “well-respected peer reviewed journal” or not. Plenty of well-respected journals have released poor papers. One such example was Wakefield’s (1998) claim of a link between vaccines and autism, published in The Lancet. “In summary, much of the ambiguity in the interpretation of these results could have been avoided with information from two concurrent or historical control groups: 1) a group to define the behavioral signature resulting from long term adulteration of the drinking water, and 2) a group to define the behavioral signature of animals with hippocampal damage in this testing system. Such controls are an essential feature of test validation and experimental design. Novel behavioral chemicals of unknown toxicity are dosed, and all possible results interpreted as neurotoxicity. Instead, both positive and negative control materials should be evaluated, and the results linked with well-characterized functional and morphological indices of neurotoxicity. “Dunipace et al. (1995) concluded that rats require about five times greater water concentrations than humans to reach the same plasma concentration. That factor appears uncertain, in part because the ratio can change with age or length of exposure. In addition, this approach compares water concentrations, not dose. Plasma levels can also vary considerably both between people and in the same person over time (Ekstrand 1978)”. “These results do not allow us to make any judgment regarding possible levels of risk at levels of exposure typical for water fluoridation in the U.S. On the other hand, neither can it be concluded that no risk is present“. Broadbent et al. (2014) used data from the Dunedin Multidisciplinary Study, which is world-renowned for the quality of its data and rigour of its analysis, and found no significant differences in IQ by fluoride exposure, even before controlling for the other factors that might influence scores. It controlled for childhood factors associated with IQ variation, such as socio-economic status of parents, birth weight and breastfeeding, and secondary and tertiary educational achievement. 6: Benefits from Systemic Fluoride Intake? For this section I’ll limit the discussion to the benefits of systemic and topical intake of fluoride. Even if the primary role of fluoride was topical, water fluoridation has a beneficial effect and makes a good delivery system. Consumption of fluoridated food and water enables transfer of fluoride to saliva and biofilms on the teeth. This fluoride, together with calcium and phosphate on the saliva, reduces acid attack on the teeth and so helps prevent tooth decay. Because fluoride concentrations in saliva decrease within an hour or so after brushing, fluoridated water complements use of fluoridated toothpaste. Our teeth are in more regular contact with food and water than they are with toothpaste. “More than 60 years of intensive research attest to the safety and effectiveness of this measure to control caries. In this case, however, it should be emphasized that despite being classified as a ‘systemic’ method of fluoride delivery (as it involves ingestion of fluoride), the mechanism of action of fluoridated water to control caries is mainly through its topical contact with the teeth while in the oral cavity or when redistributed to the oral environment by means of saliva. Since fluoridated water is consumed many times a day, the high frequency of contact of fluoride present in the water with the tooth structure or intraoral fluoride reservoirs helps to explain why water fluoridation is so effective in controlling caries, despite having fluoride concentrations much lower than fluoride toothpastes, for example. This general concept can be applied to all methods of fluoride use traditionally classified as ‘systemic’. In the light of the current knowledge regarding the mechanisms by which fluoride control caries, this system of classification is in fact misleading”. “The cariostatic effects of fluoride are, in part, related to the sustained presence of low concentrations of ionic fluoride in the oral environment, derived from foods and beverages, drinking water and fluoride-containing dental products such as toothpaste. Prolonged and slightly elevated low concentrations of fluoride in the saliva and plaque fluid decrease the rate of enamel demineralization and enhance the rate of remineralization”. “Evidence also supports fluoride’s systemic mechanism of caries inhibition in pit and fissure surfaces of permanent first molars when it is incorporated into these teeth pre-eruptively”. Quality studies continue to show fluoridation to be effective today. Newbrun (1989), Brunelle & Carlos (1990) and Griffin et al. (2007) have proven water fluoridation continues to be effective in reducing dental decay by 20-40%. “this report does not evaluate nor make judgments about the benefits, safety, or efficacy of artificial water fluoridation. That practice is reviewed only in terms of being a source of exposure to fluoride”. After the Committee looked at all relevant fluoride literature, it recommended that the EPA primary MCL for fluoride be lowered from 4.0 ppm. The stated reasons for this recommendation were the risk of severe dental fluorosis and bone fracture with chronic ingestion of water with a fluoride content of 4.0 ppm or greater. No other reasons. Had this Committee had any other concerns with fluoride at this level, it would have stated so and recommended accordingly. Additionally, this Committee made no recommendation to lower the EPA secondary MCL for fluoride, 2.0 ppm which water fluoridation at 0.7ppm is 1/3 of this value. Final recommendation of this Committee showed nothing that doubt on the safety of fluoride at the recommended optimal level. It also has no bearing on water fluoridation so using the NRC report to as a reason to stop fluoridation would be misguided. I have outlined major flaws of the science of this paper, with the major criticism being not using primary sources. There was no assessment of the quality of the evidence. One should start with secondary reviews published in peer-reviewed, high-impact journals, including meta-reviews, review articles, and Cochrane Collaboration reviews; otherwise, high quality clinical trial reports with fairly large number of subjects. Any further discussions on the ethics or legal matters with fundamental flaws in the science would make any exchange confusing and pointless. Recently an unpublished paper by Rita F. Barnett, an associated professor of Legal Research and Writing at Chapman University, was heavily promoted by Paul Connett’s Fluoride Action Network and associated social media groups. Although basically a legal paper it did have a comprehensive section on the scientific aspects of fluoridation. She argued that the science indicated that community water fluoridation was neither effective or safe and was criticised for that. One of her critics, Daniel Ryan from the Making Sense of Fluoride group, participated in an exchange with her about the science. As this has only been available in downloadable pdf format I am posting this exchange over the next few days as part of the ongoing fluoridation debate. This post today is the section from Rita Barnett’s paper in which she argues that the science does not support community water fluoridation. While a comprehensive review of all existing and emerging toxicological, clinical and epidemiological studies weighing against fluoridation or urging further research is beyond the purview of this article, a brief discussion of some current areas of concern follows. Unfortunately, rather than considering the new data objectively, public health officials and dental lobbies spearheading fluoridation schemes often ignore, reject, or suppress the evidence that does not toe the pro-fluoride party line.109 Nevertheless, as evidence against fluoridation continues to 20 Compulsory Water Fluoridation [23 Sept 14 accumulate in a variety of health risk areas, two conclusions seem readily apparent. First, there remain significant unanswered questions about the risks and benefits of systemic fluoride, and further research before imposing or continuing fluoridation schemes seems not only scientifically prudent, but ethically necessary. Second, it is no longer acceptable for public health officials to simply dismiss the accruing negative data and to continue to insist that the levels of fluoride children and adults are receiving on a daily basis are without any serious health consequences. Fortunately, tentative moves by the EPA and other federal agencies suggest that at least some public health authorities are inching towards similar conclusions. 64 See e.g. Hileman, supra note 18, at 4. See also Graham, supra note 17, at 195 (noting a pro-fluoridation report characterizing fluoride opponents as follows: “The opposition stems from several sources, chiefly food faddists, cultists, chiropractors, misguided and misinformed persons who are ignorant of the scientific facts on the ingestion of water fluorides, and, strange as it may seem, even among a few uniformed physicians and dentists.”). See also Leila Barraza, Daniel G. Orenstein, Doug Campos- Outcalt, Denialism and Its Adverse Effect on Public Health, 53 JURIMETRICS J. 307, 307 (calling those who oppose fluoridation “denialists” who “misuse science to advocate positions that contradict the overwhelming weight of existing evidence”). 65 See e.g., John Colquhoun, Why I Changed My Mind About Water Fluoridation, 41 PERSPECTIVES IN BIOLOGY AND MEDICINE 1 (1997); Dr. Hardy Limeback, Why I Am Now Officially Opposed to Adding Fluoride to Drinking Water, FLUORIDE ACTION NETWORK (April 2000), http://fluoridealert.org/articles/limeback/; J. William Hirzy, Dr. William Hirzy, Former Head of EPA’s Headquarters Union Recommends Portland Flush Fluoridation Proposal (March 2013), FLUORIDE ACTION NETWORK, http://fluoridealert.org/content/hirzy_portland/. 66 Fagin, supra note 26, at 78. 67 Fagin, supra note 26, at 78; Hileman, supra note 18, at 9. 68 See Beltran-Aguilar, et. al., Prevalence and Severity of Dental Fluorosis in the United States, 1999-2004, NCHS DATA BRIEF NO. 53 (2010), http://www.cdc.gov/nchs/data/databriefs/db53.pdf. See also Czajka, supra note 13, at 125. 69 Beltran-Aguilar, supra note 68; Peckham, supra note 13, at 165. 70 Fagin, supra note 26, at 79 (children exposed to fluoridated water were 50% more likely to have dental fluorosis than children living in non-fluoridated areas). 71 Peckham, supra note 13, at 165-66. 2 See Hileman, supra note 18 at 10. 74 Peckham, supra note 13, at 166. 75 Limeback, supra note 65 (“it is illogical to assume that tooth enamel is the only tissue affected by low daily doses of fluoride ingestion.”); Colquhoun, supra note 65 (“Common sense should tell us that if a poison circulating in a child’s body can damage the tooth-forming cells, then other harm also is likely.”). 76 Czajka, supra note 13 at 125. 77 Null, supra note 17, at 74. 78 Czajka, supra note 13, at 125. 79 Null, supra note 17, at 74; Hileman, supra note 18, at 13. 80 Fagin, supra note 26, at 79. 81 See Null, supra note 17, at 74-75. 82 Jennifer Luke, Fluoride Deposition in the Aged Human Pineal Gland, 35 CARIES RESEARCH 125-128 (2001). See also Czajka, supra note 13, at 126. 83 Fluoride Action Network, Pineal Gland, FLUORIDEALERT.ORG, http://fluoridealert.org/issues/health/pineal-gland/ (last visited June 25, 2014) (discussing/listing pineal gland studies). 85Fluoride Action Network, Thyroid, FLUORIDEALERT.ORG, http://fluoridealert.org/issues/health/thyroid/ (last visited June 25, 2014) (discussing/listing numerous thyroid studies). 86 Null, supra note 17, at 71. See also Fluoride Action Network, Endocrine, FLUORIDEALERT.ORG, http://fluoridealert.org/issues/health/endocrine/(last visited June 25, 2014) (discussing/listing numerous endocrine system studies). 87 Fluoride Action Network, Cancer, FLUORIDEALERT.ORG, http://fluoridealert.org/issues/health/cancer/ (last visited June 25, 2014) (discussing/listing numerous cancer studies). 88 See e.g., Null, supra note 17, at 77; Graham, supra note 17, at 229-240. 89 Null, supra note 17, at 77. 91 NTP Toxicology and Carcinogenesis Studies of Sodium Fluoride in F344/N Rats and B6C3F1 Mice (Drinking Water Studies), 393 NATL. TOXICOL. PROGRAM TECH REP SERV. 1-448 (1990). 92 Null, supra note 17, at 78-79. 93 E. B. Bassin et. al., Age Specific Fluoride Exposure in Drinking Water and Osteosarcoma, 17 CANCER CAUSES & CONTROL 421-28 (2006) (finding an association between fluoride exposure in drinking water during childhood and the incidence of osteosarcoma among males but not consistently among females). See also S Kharb et. al., Fluoride Levels and Osteosarcoma, 1 SOUTH ASIAN J. CANCER 76-77 (2012) (finding positive correlation between fluoride and osteosarcoma). 94 Fagin, supra note 26, at 80. 95 Phyllis J. Mullenix, Neurotoxicity of Sodium Fluoride in Rats, 17 NEUROTOXICOLOGY AND TERATOLOGY 169-177 (1995). 96Fagin, supra note 26, at 80. See also Null, supra note 17, at 74 (describing an ad campaign promoting a fluoridated spring water “for kids who can’t sit still.”). 97 Fagin, supra note 26, at 80. 98 Fluoride Action Network, Brain, FLUORIDEALERT.ORG, http://fluoridealert.org/issues/health/brain/ (last visited June 25, 2014) (discussing/listing numerous brain studies). 99 See Anna L. Choi et. al, Developmental Fluoride Neurotoxicity: A Systematic Review and Meta-Analysis, 120 ENVIRON. HEALTH PERSPECT. 1362-1368 (2012). 100 Philippe Grandjean & Philip Landrigan, Neurobehavioural Effects of Developmental Toxicity, 13 THE LANCET NEUROLOGY, 330-338 (2014) (“untested chemicals should not be presumed to be safe to brain development, and chemicals in existing use and all new chemicals must therefore be tested for developmental neurotoxicity.”). See also Diana Rocha-Amador, Decreased Intelligence in Children and Exposure to Fluoride and Arsenic in Drinking Water, Cad. Saude Publica, Rio de Janeiro, 23 Sup. S579-587 (2007). 101 See discussion infra Sec. III. 102 CDC FLUORIDATION, supra note 18. 103 Hileman, supra note 18, at 2. 104 See Czajka, supra note 13, at 127. 105 See e.g., Letter from Dr. Paul Connett to Scientific Committee on Health and Environmental Risks, the European Committee, at #7 (March 30, 2009), available at http://www.fluoridealert.org/wp-content/uploads/scher.march_.2009.pdf (“Since 1950, it has been found that fluorides do little to prevent pit and fissure tooth decay…This is significant because pit and fissure tooth decay represents up to 85% of the tooth decay experienced by children today.”). 106 Hileman, supra note 18, at 5. 107 Hileman, supra note 18, at 6-7. See also Michael Connett, Tooth Decay Trends in Fluoridated vs. Unfluoridated Countries (March 2012), FLUORIDEALERT.ORG, http://fluoridealert.org/studies/caries01/ (noting that decay rates in non-fluoridated countries have declined at the same rate as those in fluoridated countries).